Thomas Stearns Eliot (September 26, 1888 – January 4, 1965) was an American-born poet, dramatist, and literary critic whose works, such as "The Love Song of J. Alfred Prufrock," The Waste Land, and the epic Four Quartets, are considered defining achievements of twentieth century modernist poetry. Eliot was born in St. Louis, Missouri, and educated at Harvard, the Sorbonne, and Merton College, Oxford. He eventually settled in England, converting to the Anglican faith and obtaining British citizenship in 1927. Like fellow modernist poet and expatriate Ezra Pound, Eliot drew liberally on the literary canon, producing challenging, uncompromising poetry to express the complexities and calamities of the modern era. Perhaps more so than any other modernist, Eliot crafted poems that echo the beauty of classical poetry, yet at the same time express the harrowing feelings of doubt and desolation in the aftermath of two world wars—feelings that would become part of the spiritual landscape in Eliot's time. The alienation informing his early works would give way to more hopeful themes following Eliot's conversion to Christianity. In 1928, to the consternation of the literati, Eliot pronounced himself a "classicist in literature, royalist in politics, and anglo-catholic in religion." In his later writings, Eliot explored the religious aspects of time and redemption, and came to see the Christian faith and European cultural tradition as necessary responses to the anomie he had explored in such groundbreaking works as The Waste Land and The Hollow Men. T.S. Eliot was awarded the Nobel Prize in literature in 1948. Eliot was born into a prominent family from St. Louis, Missouri. His father, Henry Ware Eliot (1843–1919), was a successful businessman, president, and treasurer of the Hydraulic-Press Brick Company in St. Louis; his mother, née Charlotte Chauncy Stearns (1843–1929), taught school prior to marriage, and wrote poetry. He was their last child; his parents were both 44 years old when he was born. His four surviving sisters ranged from eleven to nineteen years older than he, and his brother, eight years older. From 1898 to 1905, Eliot was a day student at St. Louis's Smith Academy, a preparatory school for Washington University. At the academy, Eliot studied Latin, Greek, French and German. Although upon graduation he could have gone to Harvard University, Eliot’s parents sent him for a preparatory year to Milton Academy in Milton, Massachusetts. There, he met Scofield Thayer, who would later publish Eliot's most famous poem, The Waste Land. He studied at Harvard from 1906 to 1909, where he earned his B.A. The Harvard Advocate published some of his poems, and he became life-long friends with Conrad Aiken. The following year, he earned a master's degree at Harvard. In the 1910–1911 school year, Eliot lived in Paris, studying at the Sorbonne and touring the continent. Returning to Harvard in 1911 as a doctoral student in philosophy, Eliot studied the writings of F.H. Bradley, Buddhism, and Indic philosophy (he also learned Sanskrit and Pāli to read some of the religious texts). In 1914, he was awarded a scholarship to attend Oxford, and before settling there he visited Marburg, Germany, where he planned to take a summer program in philosophy. When World War I broke out, however, he went immediately to London and then to Oxford. Eliot was not happy at Merton and declined a second year of attendance. Eliot got married in the summer of 1915, and, after a short visit to the U.S. to meet with his family, he took a few teaching jobs. He continued to work on his dissertation, which he submitted to Harvard in the spring of 1916. While his thesis was accepted, because he did not appear in person to defend the thesis, he was not awarded his Ph.D. (In 1964, the dissertation was published as Knowledge and Experience in the Philosophy of F. H. Bradley.) During Eliot's university career, he studied with a number of world-famous philosophers including George Santayana, Irving Babbitt, Henri Bergson, C. R. Lanman, Josiah Royce, Bertrand Russell, and Harold Joachim. After leaving Oxford, Eliot worked as a schoolteacher and wrote book reviews and lectured at evening extension courses to earn extra money. In 1917, he took a position at Lloyds Bank in London where he worked on foreign accounts. In 1925, he left Lloyds to become a director of the publishing firm of Faber and Gwyer (later Faber and Faber) where he remained for the rest of his career. In 1927, Eliot took British citizenship and converted to Anglicanism (on June 29). Eliot separated from Vivienne in 1933, and in 1938, Vivienne was committed to Northumberland House, a mental hospital north of London where she died in 1947, without ever receiving a visit from her husband. Eliot's second marriage was happy, but short. On January 10, 1957, he married Esmé Valerie Fletcher. In sharp contrast to his first marriage, Eliot knew Valerie well, as she had been his secretary at Faber and Faber since August 1949. As with his marriage to Vivienne, the wedding was kept a secret in order to preserve his privacy. Valerie was 38 years younger than her husband. Her years of widowhood were spent preserving his legacy; she has edited and annotated The Letters of T.S. Eliot and a facsimile of the draft of The Waste Land. Eliot died of emphysema in London on January 4, 1965. For many years he had health problems owing to the combination of London air and his heavy smoking. His body was cremated and, according to Eliot's wishes, the ashes taken to St. Michael's Church in East Coker, the village from which Eliot's ancestors immigrated to America. There, a simple plaque commemorates him. On the second anniversary of his death a large stone placed on the floor of Poets' Corner in London's Westminster Abbey was dedicated to Eliot. Eliot wrote few poems throughout his career, though the few he wrote were of lasting merit. He wrote very little during his life in America that would ever find its way into print, except for the bleak early poem, “The Love Song of J. Alfred Prufrock.” Most of his greatest poetry would not be composed until he had established himself firmly in the circle of Modernists living in Europe. This has led some to go so far as to categorize Eliot as a European more than an American poet, though undoubtedly this distinction cannot be drawn so nonchalantly. Eliot made his primary home, as a writer, in London. After the war, in the 1920s, he would spend time with other great artists in the Montparnasse Quarter in Paris, where he was photographed by Man Ray and associated with the likes of Picasso, Ezra Pound, James Joyce, Marcel Proust, William Carlos Williams, and Marcel Duchamp. French poetry was a particularly strong influence on Eliot's work, in particular Charles Baudelaire, whose clear-cut images of Paris city life provided a model for Eliot's own images of London. He dabbled early in the study of Sanskrit and eastern religions. Following his conversion to Christianity and the Church of England, Eliot's work began to move radically away from the libertine and liberated styles of his fellow modernists. From this time of his conversion his poetry can be characterized as almost always religious in nature, concerned expressly with trying to preserve historical English and broadly European values that Eliot thought to be of great importance in recovering from the cultural collapse of the early twentieth century. Later in life, motivated by his strong religious and conservative feelings, Eliot gravitated away from the French symbolist poets that had influenced his early writings and towards the metaphysical poetry of John Donne, George Herbert, and Andrew Marvell. It was their clarity of image and metaphor, combined with a profoundly complex and troubled faith in the spirit that would influence Eliot's later, religious epic poems—most notably the Four Quartets—draw much of their settings from their actual places where the metaphysical poets lived and wrote. In 1928, Eliot summarized his late beliefs well when he wrote in the preface to his book For Lancelot Andrewes that stated, "The general point of view of the book's essays may be described as classicist in literature, royalist in politics, and Anglican in religion." The poem's structure was heavily influenced by Eliot's extensive reading of Dante Alighieri (in the Italian). References to Shakespeare's Hamlet and other literary works are present in the poem: This technique of allusion and quotation was developed in Eliot's subsequent poetry. In October 1922, Eliot published The Waste Land in The Criterion. Composed during a period of personal difficulty for Eliot—his marriage was floundering, and both he and Vivienne suffered from disordered nerves—The Waste Land is often read as a representation of the disillusionment of the post-war generation. Even before The Waste Land had been published as a book (December 1922), Eliot distanced himself from the poem's vision of despair; "As for The Waste Land, that is a thing of the past so far as I am concerned and I am now feeling toward a new form and style," he wrote to Richard Aldington on November 15, 1922. Despite the alleged obscurity of the poem—its slippage between satire and prophecy; its abrupt changes of speaker, location, and time; its elegiac yet daunting ability to summon up a vast and dissonant range of cultures and literatures—it has become a touchstone of modern literature, a poetic counterpart to a novel published in the same year, James Joyce's Ulysses. Like Joyce's novel, the poem itself is almost impossible to summarize, moving as it does between a wide range of voices and narratives with almost no indication to the reader. Still, perhaps because of this inherent confusion, the poem has become a landmark of the confused times in which it was written. Among its famous phrases are "April is the cruellest month;" "I will show you fear in a handful of dust;" and "Shantih shantih shantih," the utterance in Sanskrit which closes the poem. Eliot's work was hailed by the W.H. Auden generation of 1930s poets. On one occasion Auden read aloud the whole of The Waste Land to a social gathering. The publication of the draft manuscript of the poem, in 1972, showed the strong influence of Ezra Pound upon its final form, prior to which Part I had been titled "He Do the Police in Different Voices." Part IV, "Death by Water," was reduced to its current ten lines from an original 92—Pound advised against Eliot's thought of scrapping it altogether. Eliot thanked Pound for "helping one to do it in one's own way." Eliot considered Four Quartets his masterpiece, even as many critics preferred his earlier work. The Four Quartets draws upon his knowledge of mysticism and philosophy. It consists of four long poems, published separately: "Burnt Norton" (1936), "East Coker" (1940), "The Dry Salvages" (1941) and "Little Gidding" (1942), each in five sections. Although they resist easy characterization, each begins with a rumination on the geographical location of its title, and each meditates on the nature of time in some important respect—theological, historical, physical—and its relation to the human condition. Also, each is associated with one of the four classical elements: Air, earth, water, and fire. They approach the same ideas in varying but overlapping ways, although they do not exhaust their questions. "Burnt Norton" asks what it means to consider things that might have been. We see the shell of an abandoned house, and Eliot toys with the idea that all these "merely possible" realities are present together, but invisible: All the possible ways people might walk across a courtyard add up to a vast dance no one can see; children who aren't there are hiding in the bushes. "East Coker" continues the examination of time and meaning, focusing in a famous passage on the nature of language and poetry. Out of darkness Eliot continues to reassert a solution ("I said to my soul, be still, and wait without hope"). "The Dry Salvages" treats the element of water, via images of river and sea. It again strives to contain opposites ("…the past and future/Are conquered, and reconciled"). "Little Gidding" (the element of fire) is the most anthologized of the Quartets. Eliot's own experiences as an air raid warden in the Blitz power the poem, and he imagines meeting Dante during the German bombing. The beginning of the Quartets ("Houses…/Are removed, destroyed") had become a violent everyday experience; this creates an animation, where for the first time he talks of love as the driving force behind all experience. From this background, the Quartets end with an affirmation from Julian of Norwich: "all shall be well and/All manner of things shall be well." 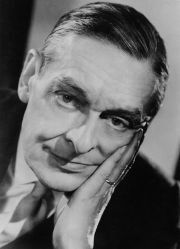 Eliot's plays, mostly in verse, include Sweeney Agonistes (1925), Murder in the Cathedral (1935), The Family Reunion (1939), The Cocktail Party (1950), The Confidential Clerk (1953), and The Elder Statesman (1958). Eliot admitted being influenced by, among others, the works of seventeenth-century preacher Lancelot Andrewes in writing his plays. The dramatic works of Eliot are lesser known than his poems, but over time have attracted more and more scholarly attention. Eliot is known for his critical and theoretical writing, particularly for his advocacy of the "objective correlative"—the notion that art should not be a personal expression, but should work through objective universal symbols. There is fierce critical debate over the pragmatic value of the objective correlative, and Eliot's failure to follow its dicta. It is claimed that there is evidence throughout his work of contrary practice (for example, part II of The Waste Land in the section beginning "My nerves are bad tonight"); but of course the worth of the idea is by no means negated by alleged lapses in practice, here as elsewhere. In 1958 the Archbishop of Canterbury appointed Eliot (and also C.S. Lewis) to a commission that resulted in "The Revised Psalter" (1963). In 1939, he published a book of poetry for children, Old Possum's Book of Practical Cats – "Old Possum" being a name Pound had bestowed upon him. After his death, this work became the basis of the hit West End and Broadway musical, Cats. Eliot's poetry was first criticized as not being poetry at all. Another criticism has been of his widespread interweaving of quotes from other authors into his work. "Notes on the Waste Land," which follows after the poem, gives the source of many of these, but not all. This practice has been defended as a necessary salvaging of tradition in an age of fragmentation, and completely integral to the work, as well adding richness through unexpected juxtaposition. It has also been condemned as showing a lack of originality, and for plagiarism. A prominent critic once published an essay called “Eliot's Poetry of Pseudo-Learning.” Eliot himself once said, "immature poets borrow, mature poets steal." Canadian academic Robert Ian Scott, for instance, pointed out that the title of The Waste Land and some of the images had previously appeared in the work of a minor Kentucky poet, Madison Cawein (1865–1914). Bevis Hillier, another critic, compared Cawein's lines "...come and go/Around its ancient portico" with Eliot's "…come and go/talking of Michelangelo." Cawein's "Waste Land" had appeared in the January 1913 issue of the Chicago magazine Poetry (which contained an article by Ezra Pound on London poets). But scholars are continually finding new sources for Eliot's Waste Land, often in odd places. Many famous writers and critics have paid tribute to Eliot. According to the poet Ted Hughes, "Each year Eliot's presence reasserts itself at a deeper level, to an audience that is surprised to find itself more chastened, more astonished, more humble." Hugh Kenner commented, "He has been the most gifted and influential literary critic in English in the twentieth century." Although he is regarded throughout the English-speaking world as one of the chief poets and critics of modern times, no discussion of his reputation can ignore the charges of anti-Semitism leveled against him. The poem “Gerontion” contains a seemingly negative portrayal of a greedy landlord known as the “Jew [who] squats on the window sill.” Another much-quoted example of anti-Semitism in his work is the poem, “Burbank with a Baedeker: Bleistein with a Cigar,” in which Eliot implicitly finds the Jews responsible for the decline of Venice (“The rats are underneath the piles. / The Jew is underneath the lot”). Even so, Leonard Woolf, husband of Virginia Woolf, who was himself Jewish and a friend of Eliot's, judged that Eliot was probably “slightly anti-Semitic in the sort of vague way which is not uncommon. He would have denied it quite genuinely” (qtd. in Ackroyd 1985, 304). Nevertheless, in his minor work "After Strange Gods" (1933), Eliot deprecates the presence of “free-thinking Jews,” who are said to be “undesirable” in large numbers. The philosopher George Boas, who had previously been on friendly terms with Eliot, wrote to him that, “I can at least rid you of the company of one.” Eliot did not reply. In later years Eliot expressed his regret over these remarks (disavowing the book, and refusing to allow any part to be reprinted), saying he was not in good health when he gave the lectures in which they were first expressed. Ackroyd, Peter. 1984. T.S. Eliot: A Life. Eastbourne, East Sussex, UK: Gardners Books. ISBN 0140171126. Bush, Ronald. 1984. T.S. Eliot: A Study in Character and Style. Nicholas Books. ISBN 9992604360. Christensen, Karen. 2005. "Dear Mrs. Eliot," The Guardian Review. (January 29, 2005). Crawford, Robert. 1987. The Savage and the City in the Work of T.S. Eliot. New York: Oxford University Press. ISBN 0198122519. Gardner, Helen. 1978. The Composition of Four Quartets. New York: Oxford University Press. ISBN 0195199898. Gardner, Helen. 1949. The Art of T.S. Eliot. London: Faber & Faber. ISBN 057108527X. Eliot, Valerie (ed.). 1988. The Letters of T.S. Eliot. San Diego. Gordon, Lyndall. 1998. T.S. Eliot: An Imperfect Life. New York: W. W. Norton & Company, Inc. ISBN 0393320936. Kenner, Hugh. 1969. The Invisible Poet: T. S. Eliot. Harcourt. ISBN 0156453819. Levy, William Turner and Victor Scherle. 1968. Affectionately, T.S. Eliot: The Story of a Friendship: 1947-1965. London: JM Dent & Sons. ISBN 0460039059. Matthews, T. S. 1973. Great Tom: Notes Towards the Definition of T.S. Eliot. New York: Harper & Row. ISBN 0060128380. Miller, James E., Jr. 2005. T. S. Eliot. The Making of an American Poet, 1888-1922. University Park, PA: Pennsylvania State University Press. ISBN 0271026812. Quillian, William H. 1983. Hamlet and the New Poetic: James Joyce and T.S. Eliot. Ann Arbor, MI: UMI Research Press. ISBN 0835714225. Ricks, Christopher. 1988. T.S. Eliot and Prejudice. Berkeley, CA: University of California Press. ISBN 0520065786. Schuchard, Ronald. 1999. Eliot's Dark Angel: Intersections of Life and Art. New York: Oxford University Press. ISBN 0195147022. Seymour-Jones, Carole. 2001. Painted Shadow: A Life of Vivienne Eliot. Reprint edition, 2003. New Yorl: Anchor Books. ISBN 0385499930. Spender, Stephen. 1975. T.S. Eliot. New York: Viking Adult. ISBN 0670291846. Sinha, Arun Kumar and Vikram, Kumar. 2005. T. S. Eliot: An Intensive Study of Selected Poems. New Delhi: Spectrum Books Pvt. Ltd.
All links retrieved August 26, 2016. Eliot's Prufrock Text and extended audio discussion of "The Love Song of J. Alfred Prufrock"
This page was last modified on 31 August 2016, at 14:16.